SUMMARY: Tells the story of Tiger Lily, the Neverland native who loved Peter Pan before Wendy Darling came along and took him away. REVIEW: I am planning to take a group of students to see the play Peter Pan next May, so to promote the trip (they have to read 10 books on a list of 27 books in order to go), I included two Peter Pan spinoffs as possible reading choices. The other book is Peter and the Starcatchers (Barry), and I may also add Capt. Hook: The Adventures of a Notorious Youth (Hart). 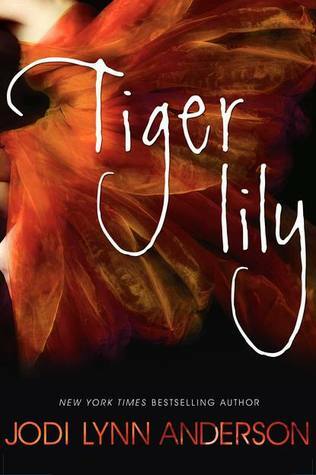 Tiger Lily is beautiful and lyrical. I love the descriptions of Neverland and how growing up/old is considered a contagious disease that affects Englishmen. 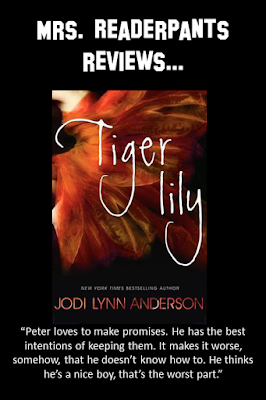 Tiger Lily is strong and courageous, and I absolutely loved her character's quiet power.The author takes her time crafting the story, selecting words carefully and perfectly to suit the emotion of the scene. I'm not sure if I was supposed to like Peter Pan, but I really wasn't a fan. He is skinny and wild and immature, and I have no idea what Tiger Lily sees in him. I was a little disappointed that Captain Hook wasn't a bigger player in the story. There is another pirate who plays a minor role for a little while, but even he isn't really much of a threat. The biggest threat to Tiger Lily is her looming marriage to a brute and, of course, Wendy's arrival in Neverland. THE BOTTOM LINE: A beautifully-written story for fans of Peter Pan or retellings. Prior knowledge of Peter Pan is not necessary. STATUS IN MY LIBRARY: We have one copy and two more on the way. It was mildly popular last year when we got it, but since I added it to our Lone Star Plus list this year, it is very popular. It's been well-received by the students who have read it.